I can’t say “shooting horses,” it just sounds too cruel. 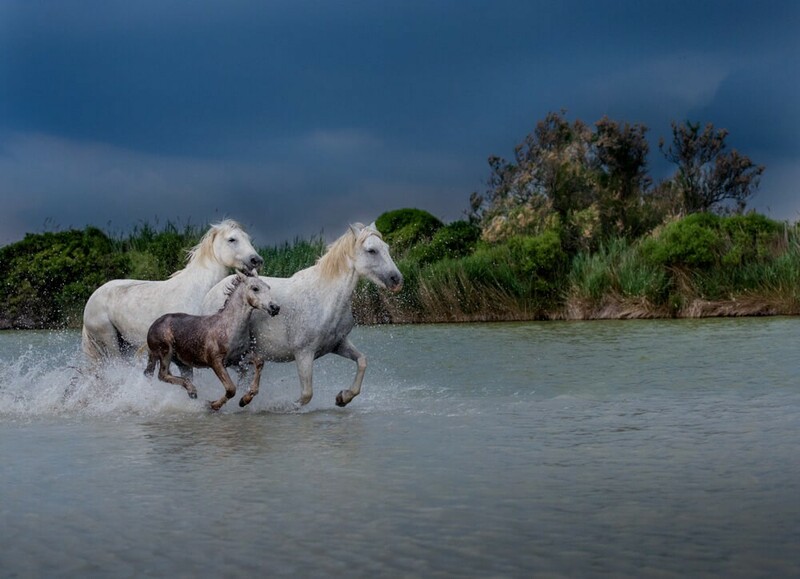 But in June I spent two days photographing wild horses and flamingos with Serge Krouglikoff, owner of Create Away workshops and a former London fashion photographer who is a who is a native of this region. We were in the Camargue, a nature preserve on the delta of the Rhone River that empties into the Mediterranean Sea in southern France. 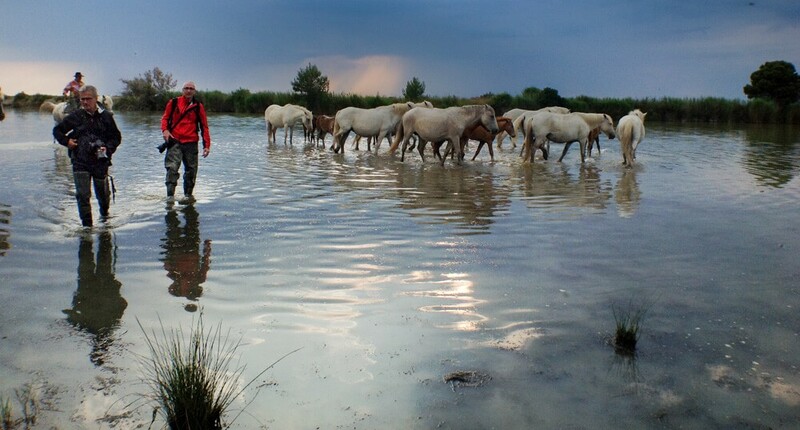 Serge, has made close friends with the Gardians, the Camargue farmers who look after these beautiful wild Camargue White Horses. In fact, his relationship with the Gardians is so close that he has been able to locate his offices in the Camargue itself. He’s the only photo tour company with this unique access to private domains and horse breeders. And as it turns out, much of Create Away’s shoot locations are inaccessible to anyone else in the region. As with any outdoor shoot, weather can be unpredictable. And on this particular evening, it was just that – lightning and thunder were brewing in the distance and rain couldn’t be far behind. A spectacular sunset was out. However, rain or not, there was no reason to cancel. These are wild horses that remain outside 365 days a year. 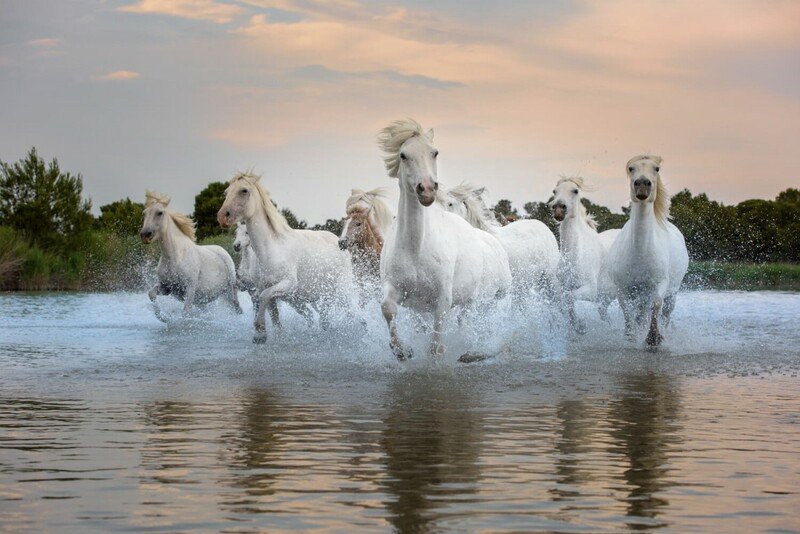 As we drove up to our entry point, the road was blocked by a herd of wild white horses and foals that seemed unattended until a Gardian on horseback appeared and signaled us to wait. Two more Gardians appeared, a simple gate was opened and slowly the horses meandered through. We followed behind. 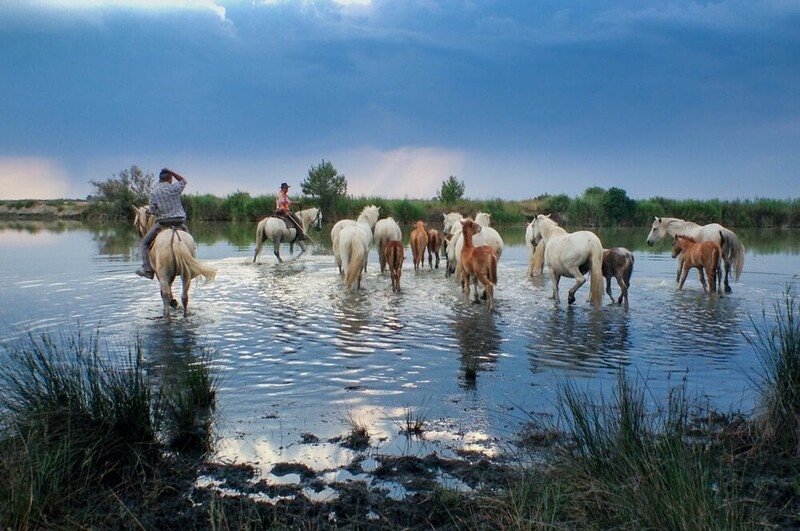 As the Gardians started moving the horses out into the marsh, we donned thigh high waders and wandered out to the center as they brought the horses around to face our cameras. A few shouts and whistles was all it took before the horses were galloping toward us, parting as they approached. These horses know why they’re here. It shows. And the impending rain clouds off in the distance proved to be fortuitous, as these white horses were aglow against this dark, forbidding sky. And the rain didn’t come until we were finished shooting and back in the car. Perfect timing. 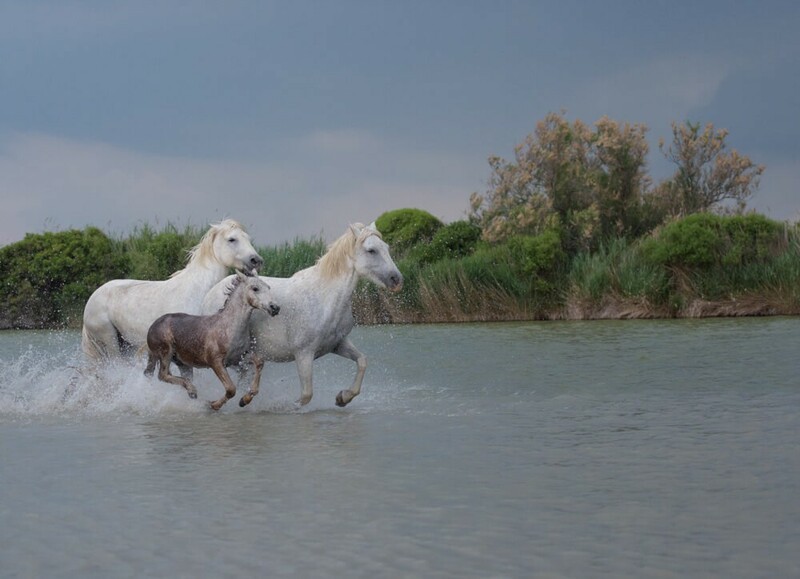 Photographing the wild horses of the Camargue is a remarkable experience. The short video here gives you an idea of what it’s like to be in the middle of it. What makes it all the more remarkable is, it’s truly impossible to take a bad photo. And Lightroom does a great job of pulling out details. Serge’s knowledge of the area and connections with the people here made this shoot all the more rewarding. It was nothing short of a remarkable experience. I’m hoping to collaborate with Serge and Create Away to create a workshop in the near future, where Serge shares his secrets to capturing wild horses and I share my secrets to creating great photos in Lightroom. If you’re interested in being contacted about this workshop, leave a comment and I’ll keep you informed. Coming soon. Part 2: Photographing the Birds of the Camargue ( I can’t say shooting here either! ).